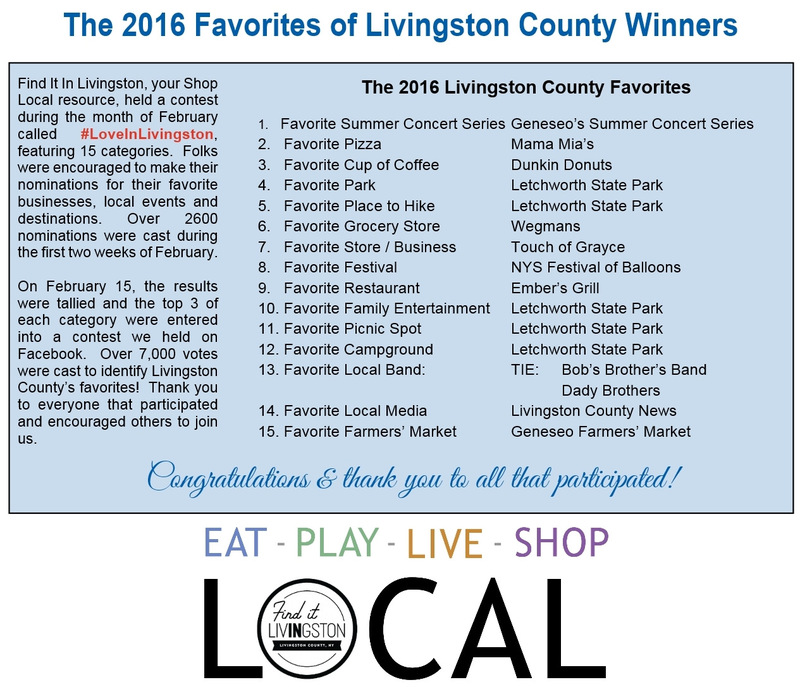 The Love IN Livingston campaign began in 2016 as part of an initiative with the Livingston County Chamber of Commerce & the Livingston County Board of Supervisors and is part of the annual Find It IN Livingston shop local campaign coordinated by the Chamber. Each year, thousands of local residents, community members, and visitors to the area vote during the month of February on their favorites in the County. This campaign has become a highly anticipated annual tradition that boasts local pride and culminates into a wonderful mid-winter reminder of all the wonderful facets of our local communities. To learn more about the Love IN Livingston campaign, please contact Beth, Marketing & Program Coordinator, 585-243-2222 or via email. Additional information about the Find It IN Livingston campaigns, please click here. How Do I Share My Love of Livingston?! We're so glad you asked! Simply participate in the contest by sharing your favorites before the end of the voting period by clicking here. You can also share the link to this page on social media, via email or by telling all your friends and family all about it. 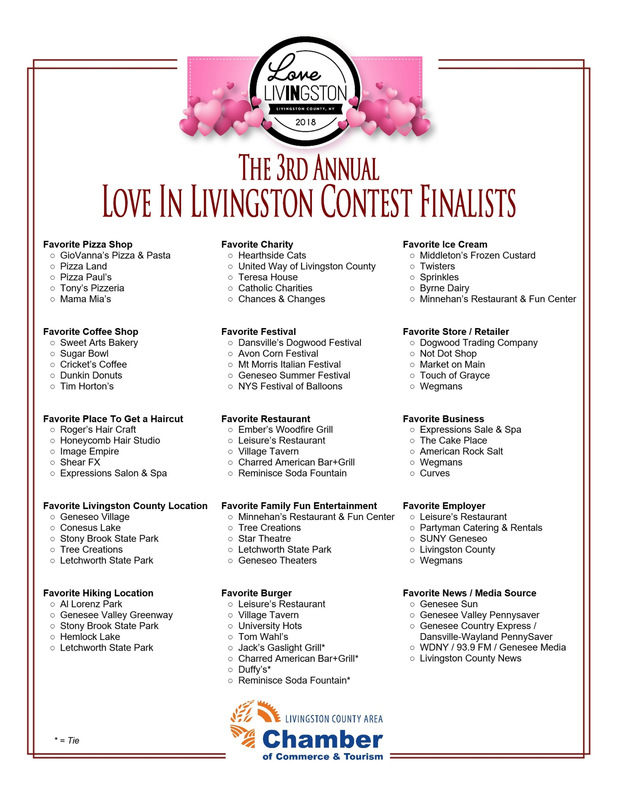 Now in its fourth year, the Love IN Livingston contest has served to promote all that our communities love about Livingston County. We encourage you to reach out to your customers, fans, friends, and family to encourage them to vote for your business or organization as well as your community's attractions. You're welcome to promote your business via social media, on your website, in person, via email or any other way you typical connect with your customers. Be sure to tag your posts with #LoveINLivingston2019! 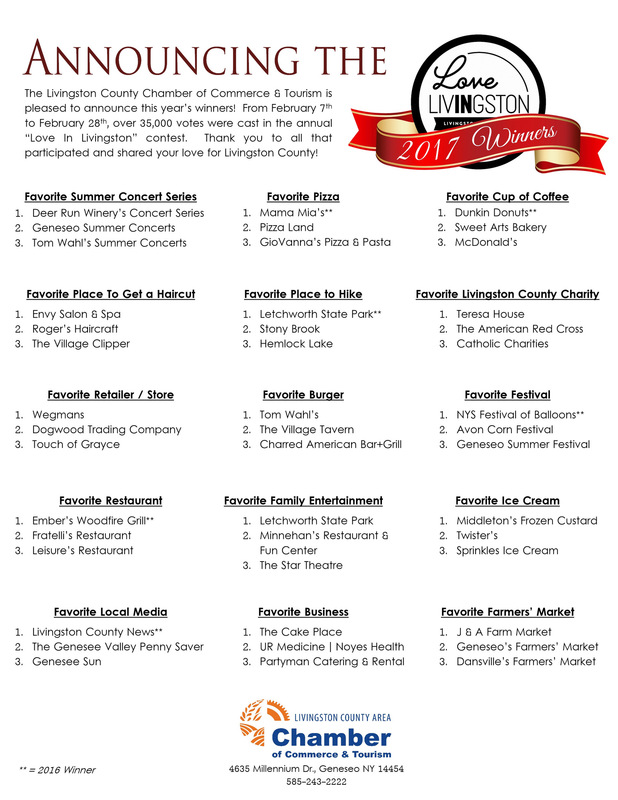 The Livingston County Chamber of Commerce & Tourism is hosting the 4th Annual "Love IN Livingston" Contest this month to highlight Livingston County area businesses, organizations, events, and attractions. Contest submissions are being accepted until Thursday, February 28th at 11:59 pm. Individuals can submit their vote, one per category, during the contest period. The Top 5 Winners will be announced on Tuesday, March 5th on the Livingston County Chamber of Commerce & Tourism's website and social media channels.